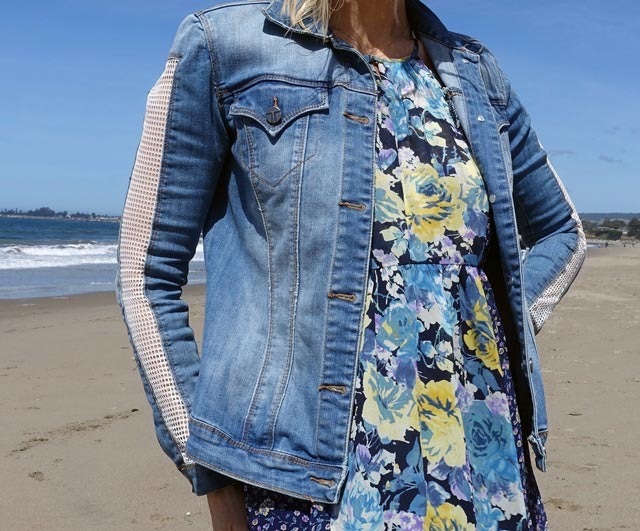 On this beautiful day in Santa Cruz, California, dressing boho seemed like the natural thing to do. I’m wearing a floral maxi sundress, denim jacket, and eh-hem, high-heeled sandals (off the sand). I’ve written about Santa Cruz before (HERE). Long story short, this gorgeous surfing town is uber laid back. Hanging out on the beach collecting sea glass, catching the sunset, or trying to spot a whale are just typical everyday activities. That’s why a long flowing, strappy dress feels so right here. Side slits make it even breezier. Contrasting patterns drew my eye to the dress when I saw it online. I love mixing patterns. And this single piece does it all for me. Also as you might recall in my LAST POST, I can’t say no to a halter neckline. Since it isn’t yet summer weather – tempatures are in the low 70s and it’s a bit windy – I need a little extra cover. That’s why I was delighted to find this lightwash denim jacket in the closet. (I packed it from Seattle!) I love that it happens to be boho-ish and matches colors in the dress. And speaking of breezes, I highly recommend wearing your hair up if you hit the beach here. Actually, anywhere near the coast gets windy by noon. Take special note of this if you have fine Scandinavian hair that floats. As for my handbag, I confess that I would have preferred a basket bag with this look. It would definitely go with the beachy, laid back vibe. But since I left nearly all of my bags in Seattle, I tied this yellow scarf around my new Furla bag. I think it works! THIS POST by Julia inspired me to decorate my bag. I hope you liked the outfit. This kind of dress is perfect for more than a day at the beach (or beach wedding): I love wearing it on the weekend to hit a farmers’ market, go wine tasting, take a walk in the city… I might even ball it up (it’s silk) and stick it in my bag for a real vacation. Beautiful. The jacket and bag are nice. It’s always a pleasure to see your new post! These pics are really beautiful and I love your beach dress! This is the perfect maxi dress. Stunning floral print and halter neckline! Such a pretty maxi dress! You look lovely Janea.